The earliest record of Armley Mills dates from the middle of the sixteenth century when local clothier Richard Booth leased 'Armley Millnes' from Henry Saville. A document of 1707 provides the first description of the mills. 'The Fulling Mill in Armley.. containing two wheels and four stocks.. also the water corn mill and the fulling mills adjoining.. containing one wheel and two stocks.' 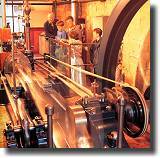 By 1788 Armley was equipped with five waterwheels powering eighteen fulling stocks. 'Fulling' is one the final processes in cloth production, it involves pounding the cloth with large hammers in pits filled with a mixture of water, urine and 'fullers earth', causing the fibres to mat together or 'felt'. 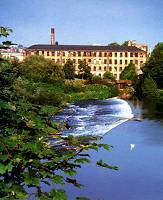 In 1788 Armley Mills was bought by Colonel Thomas Lloyd who turned it into the worlds largest woollen mill. In 1805 the mill was almost entirely destroyed by fire. Benjamin Gott the new owner re-built the mill from fireproof materials, using brick and iron wherever possible. It is Gott's mill which survives largely intact to this day. In 1969 the mill finally closed as a business and, in recognition of its historic importance was bought by Leeds City Council, re-opening in 1982 as Leeds Industrial Museum. The displays include a fully working 1920s cinema, a collection of steam locomotives and a journey through the working world of textiles and fashion. There is ramped access (some ramps are steep), toilets and lifts for the disabled. 2 miles west of Leeds City centre off the A65. Free parking and picnic area.